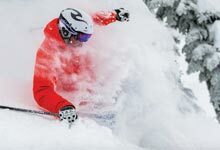 NothinButSnow has been successfully training ski and snowboard instructors in Canada for over 7 years now. It’s crazy when we think back to our first season, as we put a bunch of budding ski and snowboard enthusiasts through their paces at Big White Ski Resort. Would all of the planning and obsessing over the training programme deliver results? Oh yes it did! 7 years on it’s continued to do so, exceeding even our own expectations. In fact it’s shocking how successful our training programmes have become, resulting in market leading pass rates. 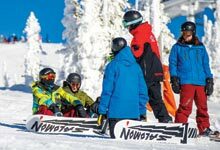 Making us the most successful provider in terms of the number of people who have successfully passed their ski and snowboard qualifications at Big white to date. Our customer reviews on Facebook are testament to this. Fact 1: Our class sizes are small. We aim to never exceed 7 people, with an average of 6 per class. This is such a simple thing to implement, but the benefits are huge. The result is more individual feedback, more time teaching and a greater personal touch. Fact 2: We provide more tuition days than any other. Nobody turns up on a course without a desire to succeed, and there is no better feeling to return home with that certificate in hand. We would rather have you choose to skip a day because of fatigue, than scrimp back on available training days, keeping you off the snow. We provide you with as much training as possible, to ensure your every success – proven by our 100% success rates. Fact 3: You will learn from the best. 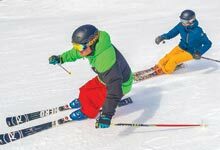 We deliver training with ski and snowboard schools that are home to the very best and most highly qualified instructions you will ever meet. All hand picked, these top notch pros are at the top of their game. Surround yourself with the best and it will surely rub off on you. Fact 4: We would only house you in accommodation that resembles an episode of MTV Cribs. Time to relax is so important because your legs will get tired whilst you build stamina, so we provide you with luxury houses and condos that offer the perfect mix of space, amenities and social living. From private hot tubs to games rooms, you will also have access to a gym and swimming pool along with breathtaking mountain views, these are the places to completely relax in. Fact 5: Flexible payment plans! We work with you to devise a payment plan that best suits your needs and meets our requirements. Find out more about our course payment plans. Hidden costs can be a nuisance, especially when you have budgeted for your 3-month adventure in the snow. We don’t like to spring any surprises on you and that goes for additional costs for exams. 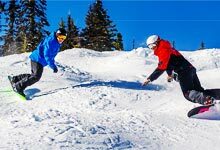 All NothinButSnow courses offer packages that included all exam fees so feel confident in the knowledge your course price has covered all the basis. It’s that gem that seems to blow a lot of places out of the water. With its amazing snow and its unrivalled ski-in-ski-out access, you will wake up everyday happy you are there. Come and meet the people that are ready to give you the memories of a lifetime. Don’t miss out on the experience of a lifetime, book today!